"Jane MacLean, Westbrook College, Class of 1973"
Westbrook College student Jane C. MacLean, Class of 1973, was a General Studies major and a Day Hop. 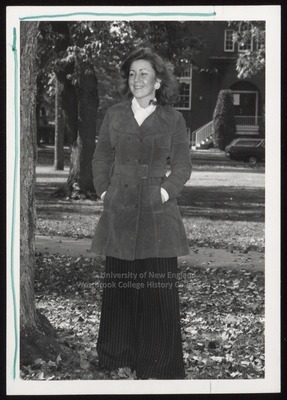 For her senior class candid photo, which appeared in the 1973 Tower Yearbook, she wore pin striped, wide legged, bell bottom slacks with a three quarter length suede coat and a white scarf. Her hair was long and curly. Jane is posing on the Campus Green with MacArthur Gymnasium behind her.